You are most likely find them fresh in September and October depending on the weather. Which mushrooms should I look out for? The king of the wild mushroom as far as Italian cooking goes has to be the Fughi Porcini (Cep). These are available dried throughout the year but only during the autumn will you find them fresh. The other great wild mushroom used in Italy is the Ovili which has an orange cap and is usually sliced very finely and used in salads (the most popular being in a salad with just parmasan and rocket). Fresh porcini have a wonderful strong rich flavour and an almost meaty texture. They're great just chargrilled with a drizzle of good extra virgin olive oil but they're even better sliced and lightly fried in oil, garlic and chilli and then tossed with some tagliatelle. Truffles are extremely strong in flavour and very expensive - which means they should be used sparingly. The most common way is shaved over a plate of pasta perhaps in a rich cream sauce. Truffles also go very well with eggs! In Italy they're a much anticipated part of the seasonal menu and people get up early in the morning to go out looking for them in the woods and forests. The best locations are often closely guarded sevrets!! If you live in Italy and can't be bothered to go out and pick them (or in the case of truffles - you don't have a licence! ), then you can always buy them. 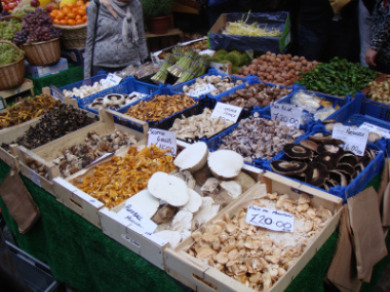 Fresh porcini are readily available in most markets when in season (assuming the weather has been favourable). Outside Italy, it might be harder to find them fresh and you'll need to be prepared to pay for them! But they're worth it! Some of the best Italian restaurants will have them on the menu when they're in season too! Try specialist Italian food stores and markets in major cities. Dried Porcini mushrooms are much easier to find in almost every supermarket now but nothing beats the taste of fresh Porcini! 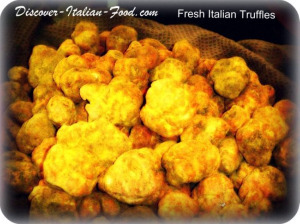 For Londoners, you can find them at "The Wild Mushroom Company" in London's Borough Market and you can eat fine Umbrian trufles when in season at Vasco and Pierro's Italian Pavillion. Like this page? Why not share it with friends on Facebook?